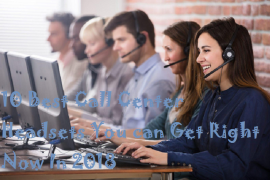 Headsets are used on daily basis by many business centers completing their over the phone tasks like taking orders, tending to customer complaints or selling products via call centers. 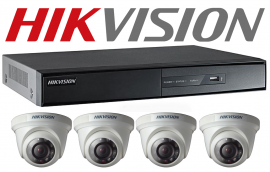 There are many great options available to users with different preferences but when it comes to professional usage, you have to look at things a bit differently in order to get the desired output. 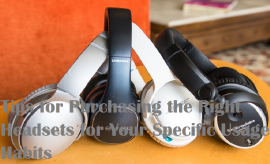 Your all day use professional headsets have to be comfortable enough to provide you that luxury of having them on your ears for most part of the day and they have to provide you clear distortion free calling experience both for yourself and your caller through efficient noise cancellation microphones. When it comes to sound quality, the best thing to know is that you will not go wrong with either option. These are both one ear over the ear style headsets and will keep one of your ear free for surrounding awareness. The Plantronics HW251 has very high quality clear audio speaker built in that will perform just great for that occasional music track as well for when you are not in the mood to take calls on it. The Jabra GN2100 has a pretty much similar sound experience, however, if you want to know the absolute best sound quality between the two, the Plantronics offering will edge ahead by the narrowest margins. The low ends on the Plantronics are considerably better with somewhat better clearer voice for the user as well giving it the win in the sound quality department but not by much. 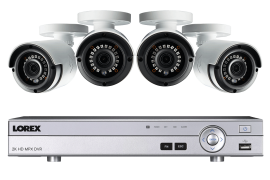 The more modern wideband frequency is certainly the newest technology and you will find that it is more compatible with a large number of devices offering high quality sound output. If you want the most natural and clear conversations with your callers without any artificial sound masking at all, the Plantronics HW251 are certainly your way to go with this one. Where the Jabra GN2100 lack behind is their implementation of the older narrowband frequency range that fails to make callers sound that much more natural. Both of these options have soft comfortable leatherette ear cushions covering the sound producing earpiece efficiently. Both are pretty soft and comfortable supporting them for longer usage perfectly however, the Plantronics HW251 take the cake again with the considerably larger earpiece coverings that tend not to move around that much while using them. Additionally, the larger ear cushion on the Plantronics will block off more outside sound and noise providing you a much separated clear experience in the ear that is playing the sound. The larger earpiece also tends to feel more comfortable to most people covering all the ear rather than just a part of it. When it comes to weight for your professional use headsets, lesser the better because you will be wearing them for extended periods of time. The least amount of weight your ears and head have to bear, the better it will be for you not causing much fatigue and ear jam. Although both of these are pretty lightweight with the Jabra being significantly lighter coming in a 21 grams to the 54 grams of the Plantronics, the latter has some other tricks including balanced weight distribution up its sleeve that cause it to feel much lighter than it actually is. 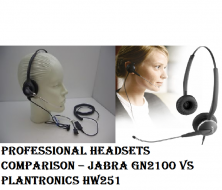 The realistic call for both of these when it comes to the actual weight and the usage style is that you will not go wrong with either but if you are looking for the absolute lightweight experience, this one will have to go to the Jabra GN2100. 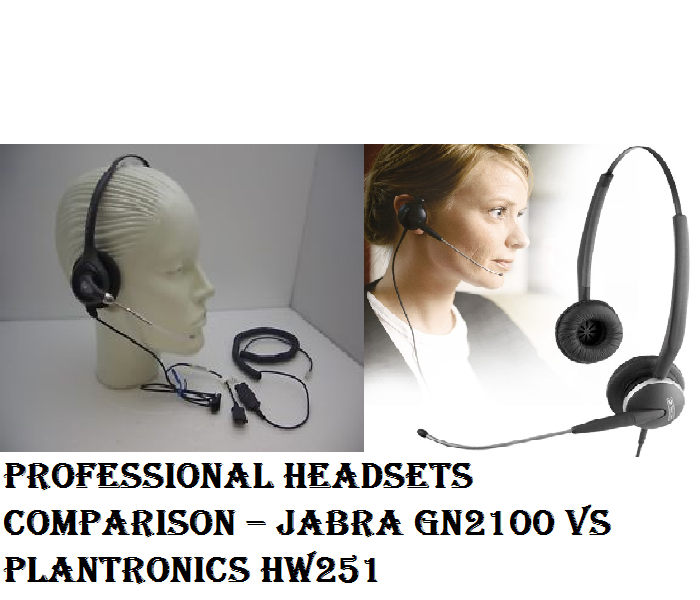 Both headsets have pretty much similar implementations including a tube that transmits your voice up to the earpiece right at the point where the microphone is housed and the rest of the plastics are just there to give them their customary shape, the Plantronics HW251 provides the upper hand with their replaceable voice tube where the Jabra GN2100 just doesn’t have this feature at all. This means that if by any chance you do manage to damage the voice tube on the Jabra, you will have to buy new headsets and on the other hand for call centers or other larger business needing a high number of headsets all the time, the Plantronics’ offering will provide the ease of having only the tube replaced that tends to save a lot of money in the long run. This is one area that has to be handed to the Plantronics as a company overall. 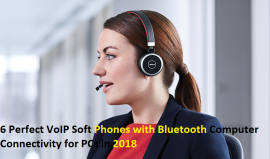 You don’t have to go deep into models or versions at all, jus the overall experience with Plantronics is outstanding and it tips the scale in favor of them when compared with anything else on the market including Jabra. Any assistance you require will be fulfilled instantly with Plantronics while with Jabra, the process can be a bit cumbersome to say the least.